WRENTHAM, Mass. 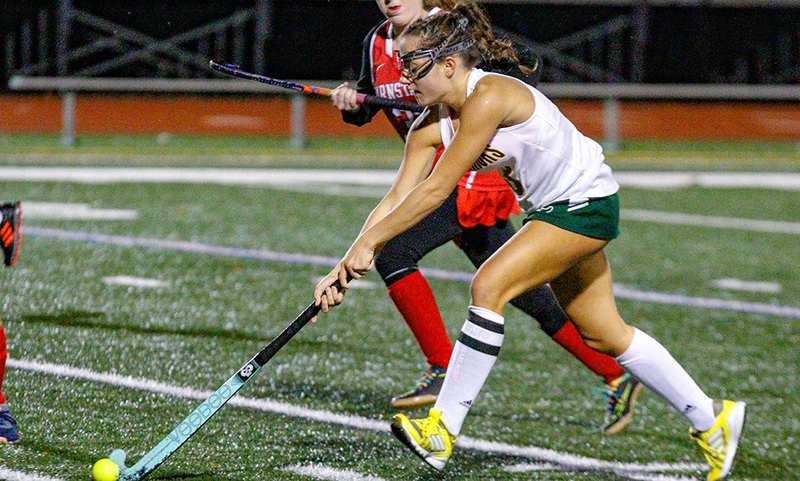 – King Philip field hockey dominated the first half, applying a lot of pressure and keeping the ball in its attacking half, but the Warriors had no success finding the back of the net. Despite five penalty corners and three shots on goal — and one that hit the post, and one just over the crossbar — King Philip’s offense was stymied by a compact Barnstable defense and went into the halftime break scoreless. So King Philip co-head coaches Erin MacDonald and Kim Meehan decided to even up the numbers to start the second half, bringing up sophomore Abby Nixon from the midfield to be a fourth forward. The change paid off as King Philip’s offense finally broke through off the stick of Nixon, and from there the third-seeded Warriors rolled to a 4-0 win over #11 Barnstable. King Philip’s best chances of the first half came in a five-minute span. In the eighth minute, senior Nicole Connor hit a hard shot through traffic but it bounced off the post and hit off a teammate’s foot to give possession to the Raiders. And four minutes later, Connor found senior classmate Kate Lindmark on a corner and Lindmark lofted a shot over the defense but the ball bounced just over the crossbar and on top of the cage. The Warriors continued the pressure in the second half, and the adjustment of Nixon up top paid off in the 42nd minute. King Philip peppered the Barnstable keeper with four shots in a shot, first off the stick of Alli Meehan, then from Nixon, again from Meehan, and the final one from Nixon into the back of the cage to make it 1-0. After going scoreless for just over 40 minutes, King Philip’s offense needed less than a minute to double its lead. The Warriors quickly pushed the ball up field and earned a corner. Off the corner, the ball worked its way around to freshman Meghan MacDonald and she used a nice back hand shot to beat the keeper to make it 2-0 in the 43rd minute. The offense continued to click, converting another corner in the 50th minute. After Lindmark sent the ball into the circle, Alli Meehan and Connor executed a perfect give-and-go. Meehan found Connor, who dished it right back and Meehan smashed her shot in to make it 3-0. With so many numbers back trying to stop KP’s offense, Barnstable’s best chance offensively was on the counter attack. One of the few chances they had going forward came in the 53rd minute. Barnstable’s forward came streaking up field but her counter bid was thwarted by Emma Izydorczak. King Philip added one final tally in the 54th minute. The Warriors used its speed to get past the defense as Alli Meehan connected with Nixon right in front. But instead of shooting, Nixon used an extra pass to find Raegan Simeone all by herself in front of goal and the junior buried her chance to make it 4-0. King Philip field hockey (18-1-1) advances to the D1 South Semifinal and will play #2 Somerset-Berkley (19-1) in a rematch of last year’s D1 South Final (KP won 1-0). The game is scheduled to start at 7:30 at Taunton High School.